Note: Please compare your product with our left image carefully. If their position of screws are different, please contact us. Replacing the HP G50 G60 G70 Compaq Presario CQ50 CQ60 CQ70 CPU fan is not easy, you will have to disassemble the whole laptop as the cooling fan and heat sink are located between the motherboard and the base enclosure. You can download the disassembly manual on the lower right of the page. 1. Shut down the computer. If you are unsure whether the computer is off or in Hibernation, turn the computer on, and then shut it down through the operating system. 3. Disconnect the power from the computer by first unplugging the power cord from the AC outlet and then unplugging the AC adapter from the computer. 1. Turn the system board right-side up, with the front toward you. 2. Disconnect the fan cable from the system board. 3. 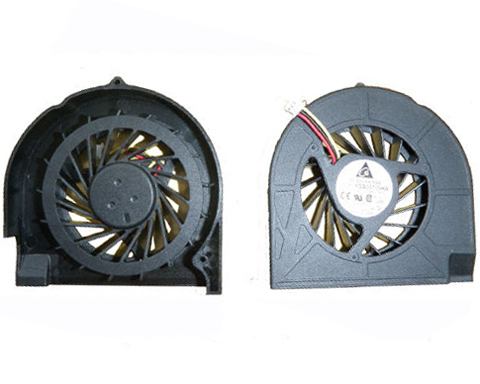 Turn the system board upside down with the fan assembly toward you. 4. Following the 1, 2, 3, 4 sequence stamped into the heat sink, loosen the four Phillips PM2.0x10.0 spring-loaded captive screws that secure the fan/heat sink assembly. 5. Remove the fan/heat sink assembly by lifting it straight up. 6. Loosen the 4 Phillips PM2.0x11.0 spring-loaded captive screws that secure the fan/heatsink assembly. 7. Remove the fan/heat sink assembly by lifting it straight up. Reverse the procedure to install the new and and assemble your HP G50 G60 G70 Compaq CQ50 CQ60 CQ70. Please don't forget to clean the old thermal grease and apply new.